Nothing lets friends and family know theyre special more than a unique, handmade card. 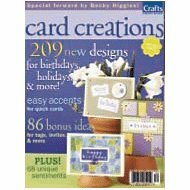 And youll find year-round inspiration with the 200 ideas in Creating Keepsakes Card Creations. Youll enjoy using the latest products (and your own scraps), as well as your favorite paper and scrapbook techniques to create fun, festive cards for any occasion. The ideas will also give you inspiration for your scrapbook, gift tags and wrap, and invitations. Find the perfect message for your cards in the Sentiments section, and learn to make large numbers of cards at once easily with our quick tips.